Killer whales are such beautiful creatures and when we see them, we think of amazing experiences like whale watching cruises. Well, you don't have to go on a cruise to enjoy Killer Whales. Nope. You can even have one as a pet. This adorable little plush Killer Whale keychain would be delighted to accompany you on all your adventures, be it on your key ring, belt loop, backpack, purse, or even looped around your finger. With soft black fur, soft white tummy and spots, this killer whale stuffed animal keychain is the perfect take-along pal. Fun Facts about Killer Whales: Did you know that Killer Whales live in groups called pods and that they can live to be 80 years old in the wild? 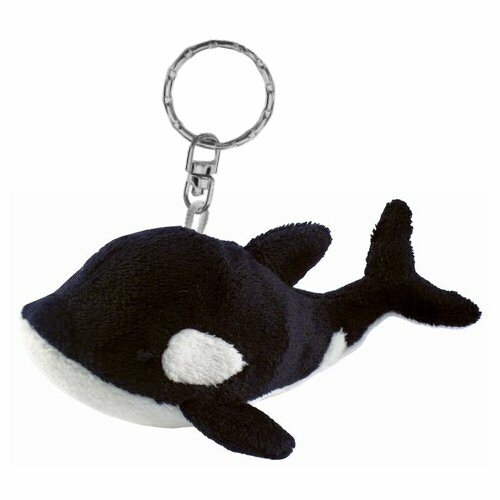 Take good care of your Killer Whale plush keychain and it will last that long too! Ahab Mini Flopsie is a lovable and beautiful stuffed whale with a unique corduroy underbelly. Shamus, this adorable Dreamy Eyes stuffed whale has soft black fur, white tummy and accents, fun fins, and big, sleepy blue eyes. This adorable little Handfuls plush whale has a soft black body, white tummy and accents, and watchful eyes. Transform your child's room into a whale of a tale with this customizable Whale fabric wall art. This adorable little crab stuffed animal keychain has soft red fur, and fun floppy legs. This cute little dolphin stuffed animal keychain has soft turquoise fur and a light blue tummy.